Bordering the Mediterranean Sea and on the ‘golden coast’ (Costa Dorada) in the east of Spain, La Torre del Sol luxury camping site enjoys a pleasant, warm climate and is a good choice for families and couples. For a camping holiday near the beach, this site is ideal. Visitors to La Torre del Sol campsite should note that LUX-camp offers accommodation in existing mobile home options on site; private individual camper vehicles or private tents are not permitted. Why should I stay at La Torre del Sol? Campsite highly rated by previous luxury camping visitors for location, leisure options and cleanliness. Good onsite facilities and activity programme. Choice of various other sports and leisure activities nearby. Located next to a sandy beach, with tree lined walkways with shaded areas. 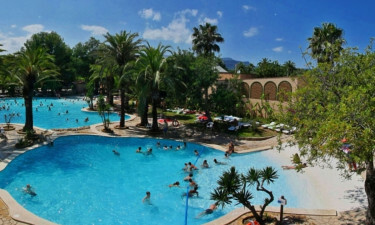 A green oasis next to the blue sea with palm and olive trees, La Torre de Sol enjoys a warm climate. Open from mid-march to late October, the site has over 1,000 pitches. Electrical power is supplied to accommodation and mobile homes, while wi-fi is also available. There is an Internet café on site. 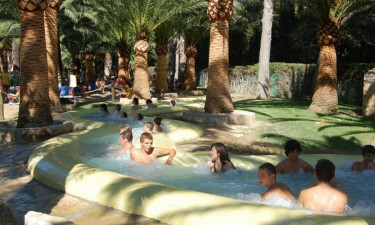 There are three swimming pools including the largest in the shape of a lagoon, with a Jacuzzi. Additionally, there is a smaller circular pool for children, whereas those who prefer to bathe in the sea will love the convenience of the adjacent wide sandy beach and blue waters of the Mediterranean Sea. The site also boasts a fitness club and a pitch for football and other sports. Other facilities include baby changing rooms, washrooms (wheelchair friendly) and mini-laundry. A children’s play area offers activities and entertainment, while for grown ups the site has table tennis, a sauna, cycle hire and mini golf. Other activities include tennis tournaments, squash and rifle or pistol shooting. Alternatively, choose from beach volleyball, water polo in the pool, or leisurely ‘petanque’. The hobby club offers painting and pottery; evening entertainment includes musical groups, cabaret and flamenco dancing. Within just 3 kilometres there are sailing and surfing opportunities, and golf within 5km. For cyclists, weekly trips over the Mont Roig trails open up over 160 kilometres of cycle routes – all accessed with ease from the campsite. 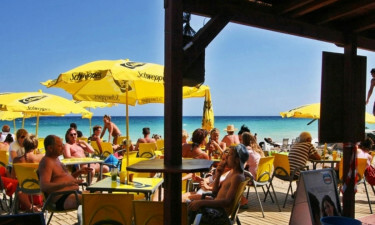 A snack bar and restaurant are available on site, or there are restaurants along the seafront. The site has a small supermarket for groceries and fresh bread, in addition to other shops in nearby L´Hospitalet de l’Infant.